“…I love Gunnery’s heartfelt characters. We join Emily at the beginning of the book frantically cutting out her now ex-boyfriend from all of their pictures making it easy to slip into her perspective. Emily For Real is a lighter read about the true meaning of family, issues of identity and genuine friendship. During her TD Canadian Children’s Book Week tour of Manitoba, Sylvia Gunnery (Emily For Real, 2012) had the opportunity to talk with Jordan Wasilka of the Westman Journal. The interview made the front page. We regret that this link is no longer available. Two Pajama Press authors begin their TD Canadian Children’s Book Week tours today: Alma Fullerton in Alberta and Sylvia Gunnery in Manitoba. The Canadian Children’s Book Centre interviewed both of these wonderful authors before they left. Click here to find out what famous writer’s hometown Sylvia is excited to visit. And then click here to learn more about the TD Canadian Children’s Book Week! Alma Fullerton is the author of two Pajama Press books: A Good Trade (2012) and the upcoming Community Soup (June 1, 2013). Her novels Libertad, Burn, Walking on Glass and In the Garage have earned her many awards. 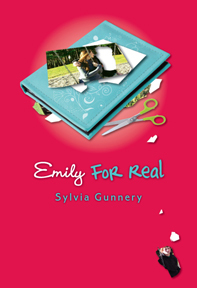 Sylvia Gunnery is the author of Emily For Real (Pajama Press, 2012) and more than fifteen other novels for young people. A recipient of the Prime Minister’s Minister’s Teaching Award, she regularly gives presentations and writing workshops young people, inspiring them to write just as they have inspired her. Sylvia Gunnery had to turn her writing desk away from the ocean. “I was getting distracted too much,” she says. There are trees outside the window next to her desk now, and on the day we talked, a group of ducks wandered past, peering in at her in an inquiring way. The hoop hangs on a framed print from the Writers’ Trust of Canada that is signed by Margaret Laurence, Margaret Atwood, Pierre Berton and Graeme Gibson. In this space, Gunnery completed her most recent novels, Emily for Real and Game Face. And, in this space, a stone’s throw from the Atlantic, Gunnery is — even after publishing 15 books — working hard at continuing to develop her skills. How has being retired changed your writing process? I taught because I loved teaching young people. Still do! I was not a teacher to financially support my writing. But there are lots of bonuses to being a retired teacher. The biggest bonus is time. I loved teaching and made sure I always did the best job I could possibly do to inspire my students to care about reading and writing and all the other ways in which we get to know who we are and how we fit into this world. That meant a big commitment of time. Looking back, I have no idea how I managed to write all those books during the 80s and 90s. The two months of summer were a gift! Now, I come to my writing studio in my home every day to write, to read, to research, to revise, to connect online with other writers, and on and on… And that’s a gift, too. But you have lost daily access to your target audience! In the late 70s, I had a few stories published in literary magazines, so I thought I was on my way down that path. Then, a close friend changed my direction when he said, “You’re always telling stories about your students. Why don’t you write teen fiction?” Two weeks later, a new student was brought to the door of my Grade 8 classroom. Immediately I wondered what might have brought her to our school halfway through the school year and how might she feel about what’s happening in her life. I’m Locker 145, Who Are You? started at that very moment and it was published a year later (in 1984) by Scholastic. I’ve been stealing stories from students’ lives ever since! As for having daily access to my target audience, like any other writer, I watch and listen. No matter where I am — in an airport, on a bus, in crowded school hallways, walking on the beach, waiting in a line-up — I’m always eavesdropping on teens, wondering why they’re saying what they’re saying or doing what they’re doing. When you first began writing, you had the good fortune to bump into some of Canada’s greatest writers. Canadian Fiction Magazine, she said, “Sylvia, you are a real writer.” My spine straightened up because Joyce Barkhouse had said this. We had a wonderful friendship. We spoke of writing so much. Writers don’t come out of a vacuum. You come out of your experiences and the support of your community. Did you always plan on writing? Being from the north end of Halifax and reading only British and American authors in school, the idea of becoming a writer didn’t occur to me. I didn’t go to Banff until I was 30. But I always wrote, even as a little kid. I am from a storytelling family. We would sit around the table until the leftover food turned to glue because we were talking. There was constant storytelling. And when I was little, my older sister, Barb, would read to me from thick hard-covered books at night. And then we’d turn out the light and she’d say, “Okay Shrimp, tell me a story.” I’d make up stuff to tell her — always about hope and strength and moving on and joy. You have done a lot of writing about how to teach young people to write. You’ve written two books on the subject for educators. What is your advice to people — teachers and mentors — trying to inspire new writers? At Banff during that summer writing session, I discovered a significant barrier to successful writing in schools — choice. As well meaning and thoughtful teachers, we were always trying to come up with the best writing topics to engage our students and make them care about writing. But they were our topics. Our choices. Unless the writing themes truly belong to the students — not as a group, but individually — the writing will simply be an assignment done for marks in a course. There’s not much room for the kind of commitment necessary to real writing. When I go to schools to do writing workshops, teachers sometimes say that I shouldn’t expect much because the kids just don’t like writing. Those teachers always seem really happy when I prove them wrong. It’s not magic — it mostly comes down to choice. I’m interested in why we choose to write the stories that we do. What do you think it was that drew you to Emily for Real? What I started with, before I even imagined Emily herself, was the idea of family secrecy, especially the effects of secrets on the people who don’t realize the secrets even exist. My theory — and I had enough evidence for this in memoirs I’d read or from personal stories shared with me by acquaintances — was that secrecy would eventually rot a family from the inside out. But as Emily told her own present-tense story, my theory about family secrecy changed. I came to see that the family would not necessarily rot from the inside out if they all truly loved each other and demonstrated that love. Emily’s extended family does that. Like my own did. Our house on Hillside Avenue in Halifax was home to Mom, Dad, my older sister, my grandfather Gunny, and my godmother we all called Tettie. If I fell backwards, there was always that cushion of love there to break my fall. As Emily tells her story, she comes to see that her life will not always make sense and that there’ll be lots of surprises, but she also recognizes the support that love offers. You’ll be talking about Emily for Real as part of this year’s TD Canadian Children’s Book Week. I have also heard you speak passionately about Nova Scotia’s Writers’ in the Schools program. Why do you think these kinds of opportunities matter? When people can see that somebody values something enough to call it a “Week,” that’s a gigantic huge message in itself. I think it’s important for the public — people going to libraries, kids in schools — to hear the language around author visits, illustrator visits, storytellers, and to realize that it’s part of their environment too. A friend visiting me said recently, “When I was in school, words were everywhere. But now — words aren’t anywhere anymore.” That’s true for a lot of people. And unless we have these celebrations and they are not token — not “book minutes” but “book weeks” — people in Canada can lose words. If we don’t say these things, they will be gone. And to be one of those messengers sent out across the land — it’s just thrilling! —Kathleen Martin is a writer living in Halifax. When Emily’s Grandad dies, she’s more concerned with her break up. When a mysterious guest shows up at her Grandad’s funeral, claiming to be an old friend of her Grandad’s Emily’s life gets suddenly more complicated. Her grandfather had a secret life and as it tears Emily’s family apart, Emily finds herself questioning everything she ever knew about her family. Although Emily’s family situation—secret affairs, hidden adoptions, illegitimate children—could have come across as an over the top soap opera plot, Emily’s genuine characterization keeps the situation grounded in real emotion that readers will be able to relate to. The book is refreshingly romance-free—save for an odd, nearly out of place romantic development in the last twenty pages—giving Emily room to focus on her family and friend relationships, includg her relationship with Leo. Teens more interested in friendship and family than romance will find themselves relating to Emily and rooting for her through her struggles. Rating: G – Good, even great at times, generally useful! The Canadian Children’s Book Centre has announced the 30 authors who will be touring for TD Canadian Children’s Book Week 2013 and we couldn’t be more thrilled: two Pajama Press authors, Sylvia Gunnery (Emily For Real, Spring 2012) and Alma Fullerton (A Good Trade, Fall 2012), have been selected to take part. You can see the full list of participating authors here. The TD Canadian Children’s Book Week is an annual event during which Canadian authors give presentations in schools, libraries, bookstores, and community centres across every Canadian province and territory. Over 25,000 kids, teens, and adults take part in this celebration of reading and Canadian literature. Further information and applications to host an author will be available on the TD Canadian Children’s Book Week website. The tours will take place from May 4 to May 11, 2013.